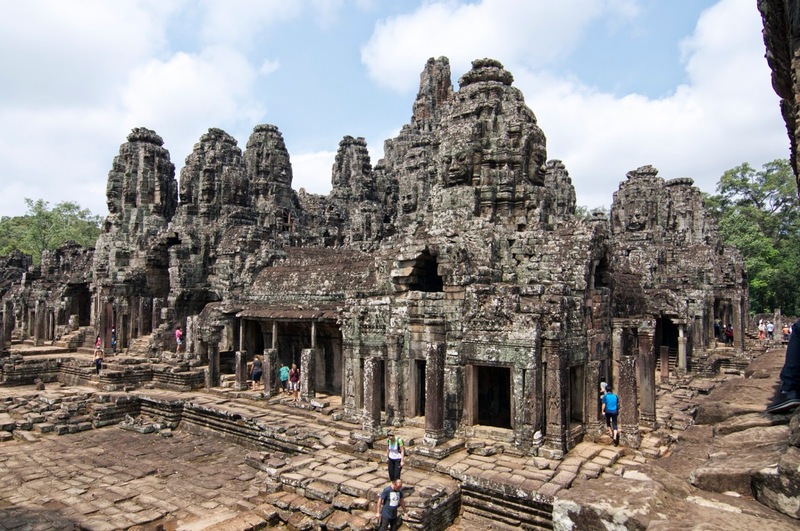 Its been a couple of weeks now since we returned from Siem Reap, Cambodia and we still cant believe we've actually visited Cambodia, yes Cambodia, We've been to Cambodia!!! Growing up I probably hadn't even really heard of the country and then as a teenager it was a place of mystery and temples, a place you never got to visit. You heard of some people visiting in their gap year or taking a year off to travel, not that any of my friends did any of this. 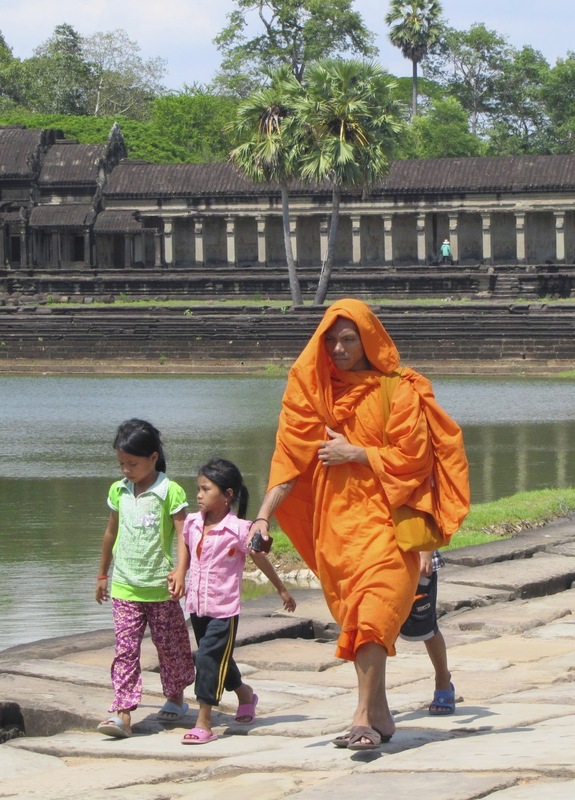 Cambodia was just a place I would read about and never, never, ever in a million years dreamt I would one day visit! 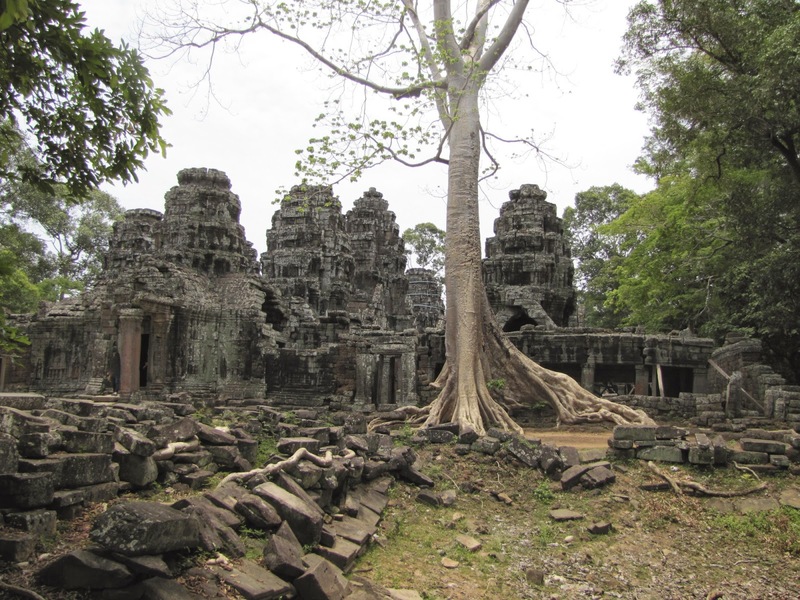 OK we may have gone to the "tourist capital" of Siem Reap but that's only become so because of its proximity to the temples, being just a few km away from the centre and, to be honest it wasn't as touristy as I expected. 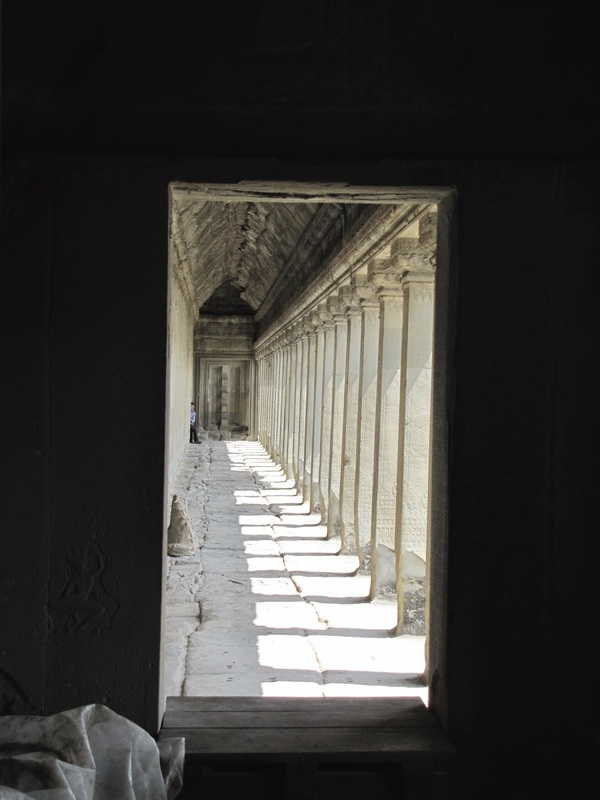 In another blog post I will speak a little about the people and feeling of the small part of the country but this post is dedicated to the temples, after all that was the reason we made the trip in the first place. Now I don't want this to sound like a piece from Wikipedeia or some long drawn out monotonous guide book and we certainly didn't see all the temples in any stretch of the imagination, however I will give a quick run down on the temples we did visit over our 3 day visit. 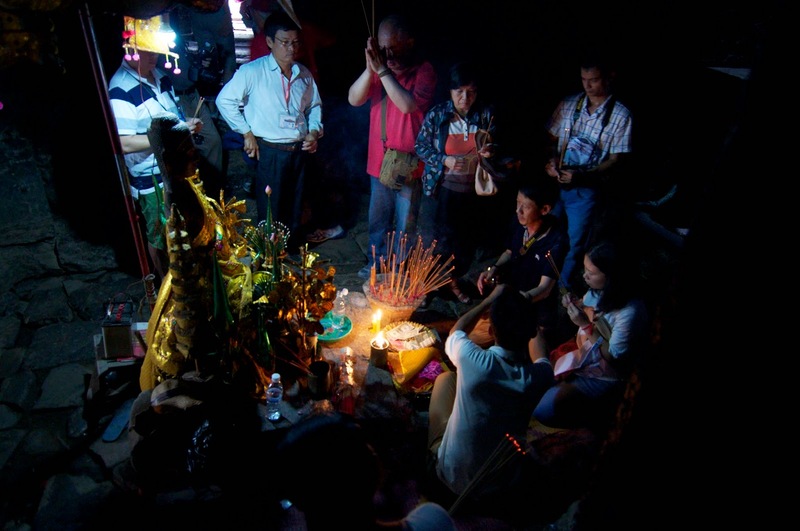 To visit the temples in the Park you must purchase a pass either a 1 day, 3 day or 7 day pass. 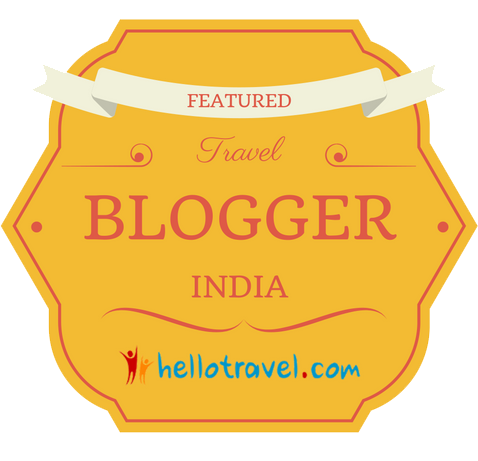 We opted for the 3 day at US$40 per person. 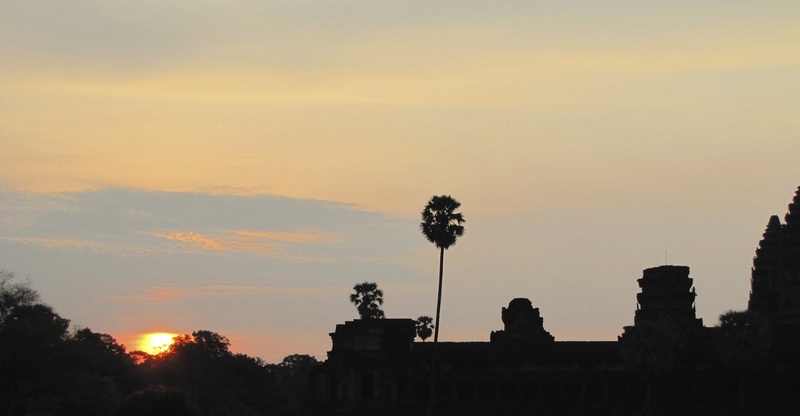 Of course you cant go to visit without trying to experience the sunrise at Angkor Wat. So 4am saw us dragging our nodding, sleep filled selves out of bed and into a tuk tuk for the 15min ride to Angkor Wat (City Temple) along with the many other 100s of people doing so as well! It was certainly worth doing, the sunrise was great but not as spectacular as I hoped for but I guess it all depends on the time of year and that days weather. We weren't alone to see the sunrise!!! 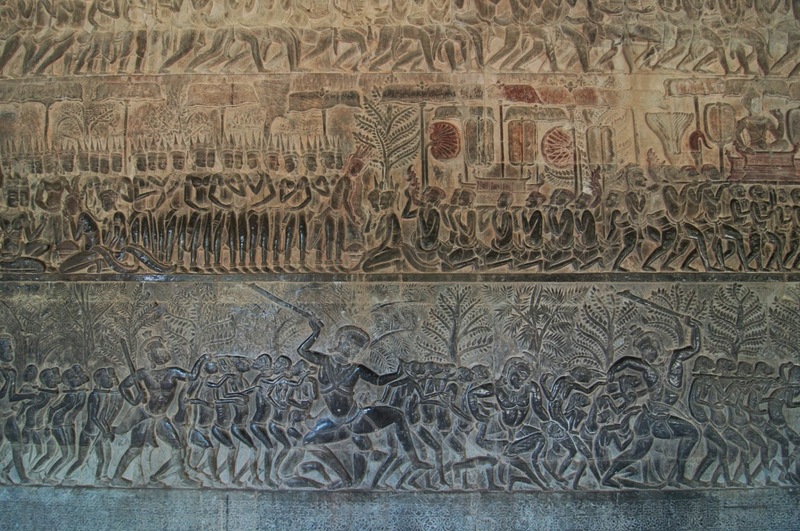 One of the hundreds of the bas reliefs. I could fill a complete blog post just on these alone! Do you get the feeling thousands of people have passed by here and rubbed a certain part of this females body! From here we moved onto what is one of my favourite of all the temples I saw Ta Prohm (originally called Rajavihava and built in 12th and 13th centuries it was built as a monastery and university) What makes this a magical place for me and the many thousand others visitors is that nature has been left to take over since it was abandoned in the 17th century, until conservation works in the 21st century. 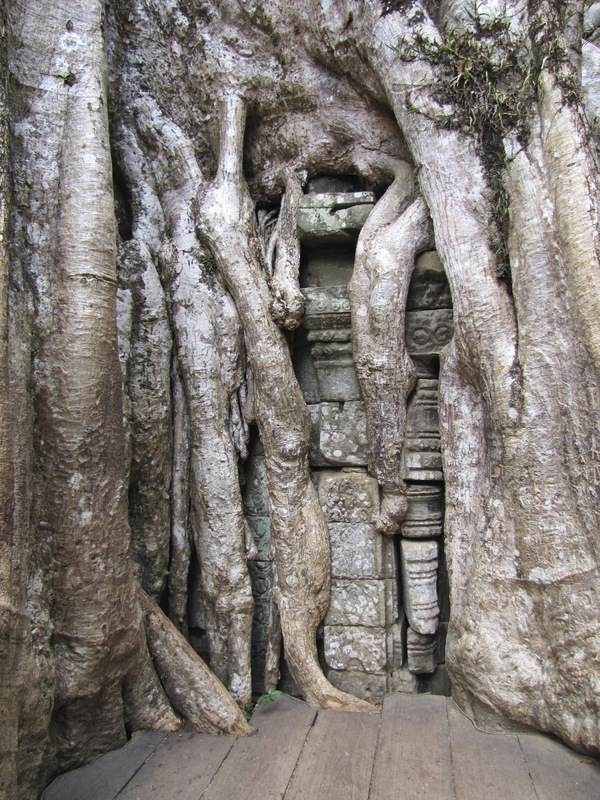 Indeed the temple itself seems to have merged with the jungle with the fascinating trees, roots, trunks and branches becoming one with the building. In places its the trees that are holding the building together. There is almost another world feeling about the place, magical and mystical a place of fairy tales and childhood stories. Yes that is a tree growing out of the roof! is it a building? is it a tree? 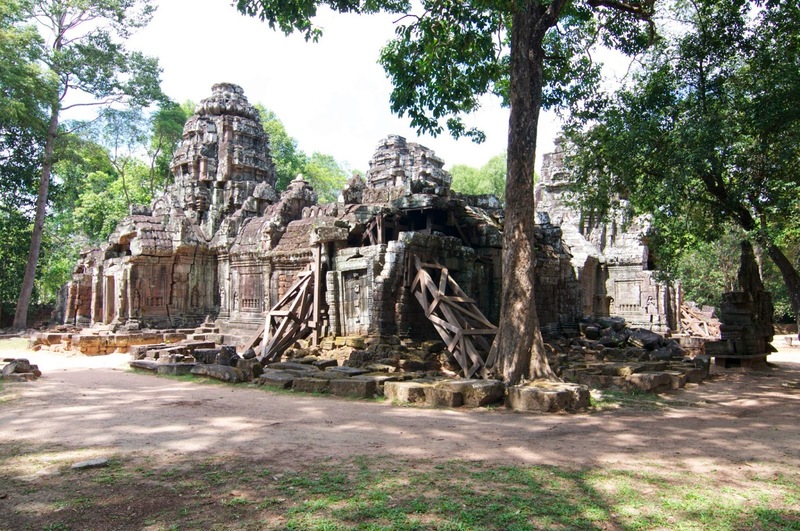 Banteay Kdai (City of Chambers or Citadel of Monks) was built in 12th and 13th centuries as a Buddhist monastery. In very poor condition there are thousand upon thousands of stone blocks littering the ground,with as many again stacked up in great mounds waiting for those restoring to put back together this giant jigsaw puzzle of building blocks. 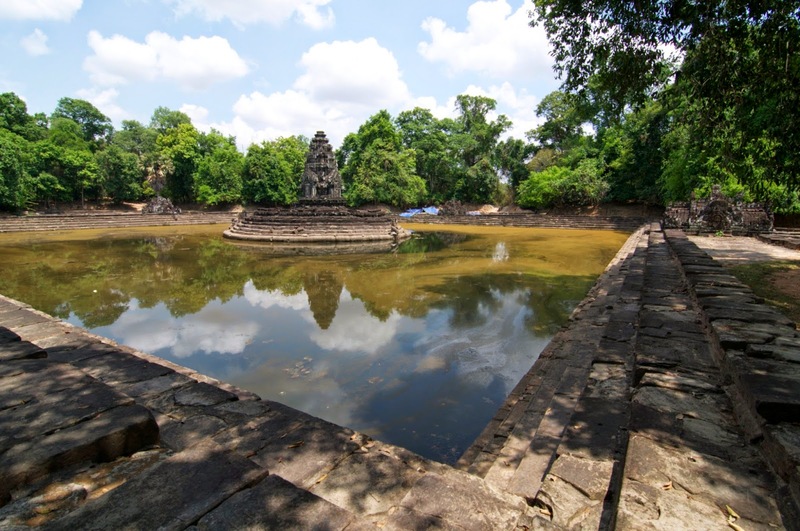 Across the road from the East exit of Banteay Kdai, is Srah Srang a 10th century baray or reservoir believed to be a Royal bathing pool. Day 2 arrived but we didn't have a pre dawn start and set out at a much more respectful 09:30 This day saw us head to the last capital city of the Khmer Empire, Angkor Thom (Great City) Within this city are numerous other temples and the gateways into the city are something out of a history book. 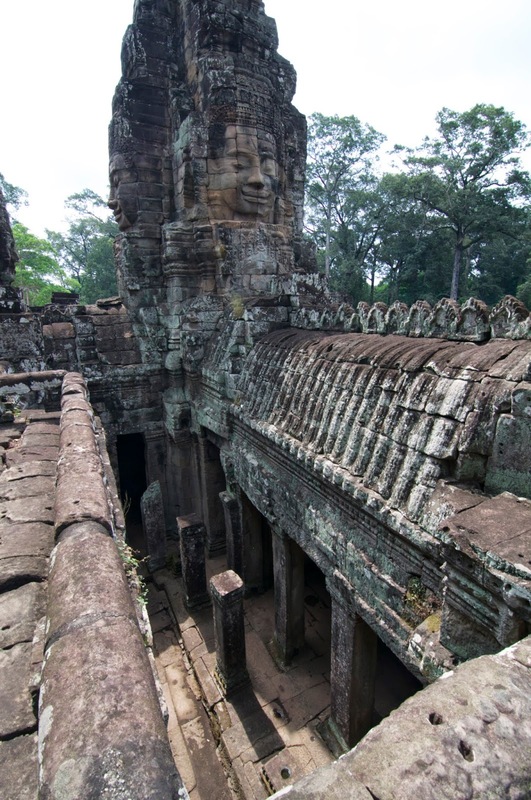 Although established in the 12th century many of the temples predate this which shows the area was in use as a major site well beforehand. 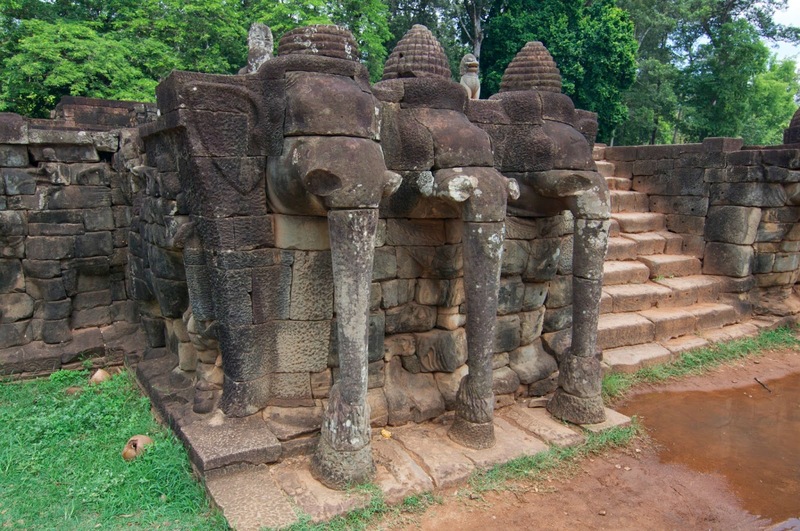 Each gateway and bridge into Angkor Thom is guarded by the 7 headed Naga (serpent). 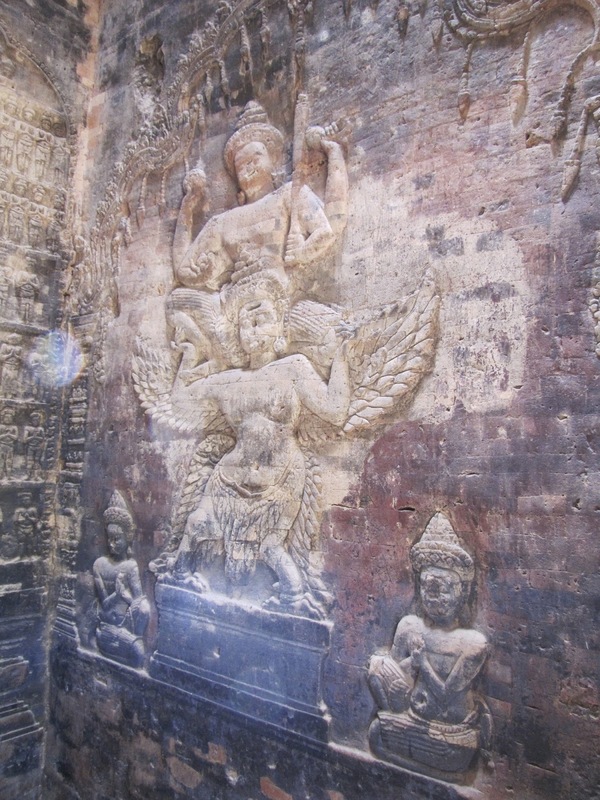 On the left hand side of the Naga bridge,as you walk towards the entrance, Gods are seen holding the Naga and on the other right hand side the figures are depicting demons. 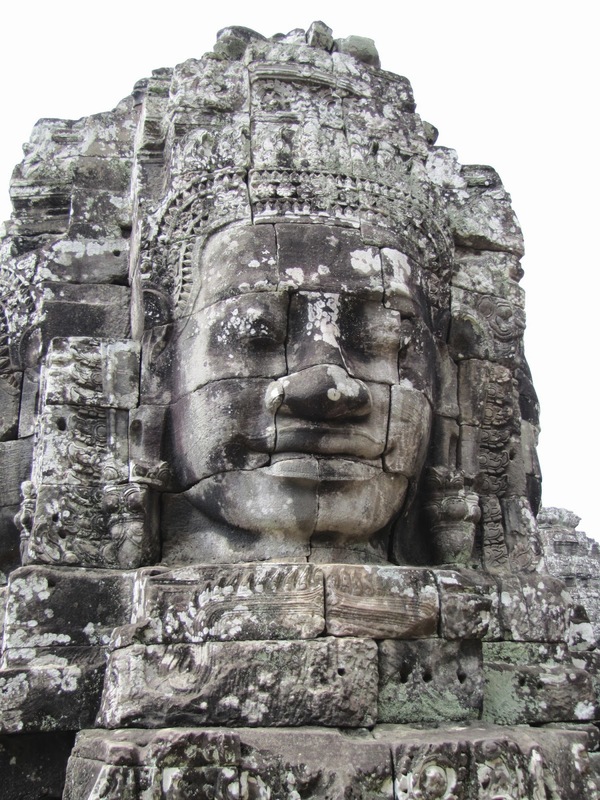 First stop was the many faced temple of Bayon. If you every felt you were being watched - you are!!! 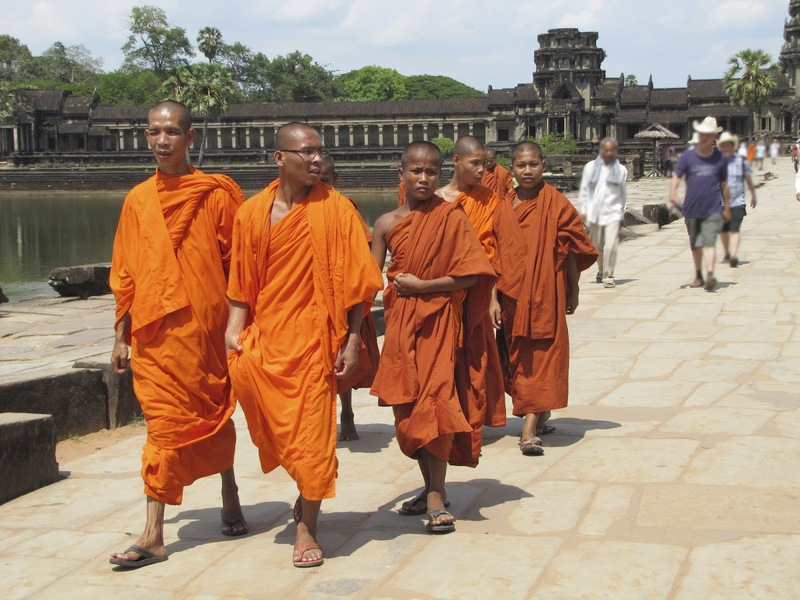 Originally built in the late 12th century by a Buddhist king it was later modified by a number of Hindus kings. This is something we found throughout our visit and at first struggled to get our heads around, this melding of Buddhist and Hindu culture. 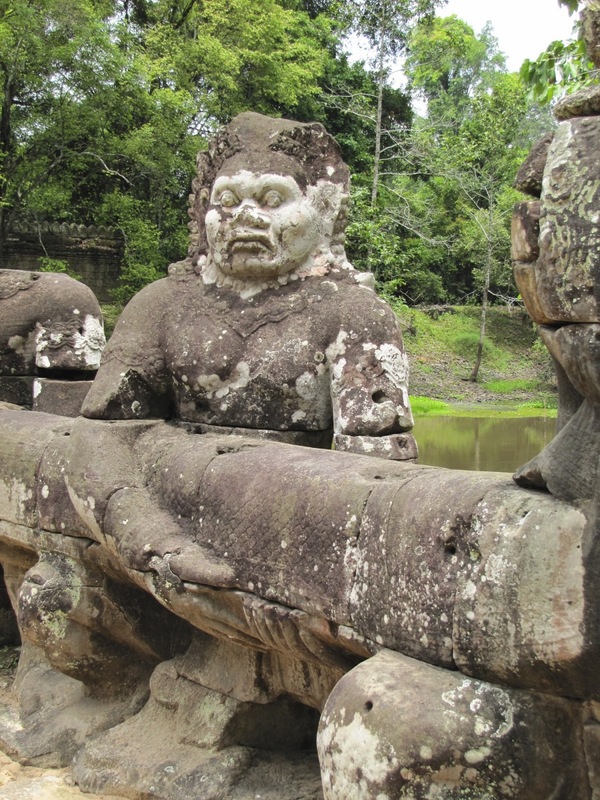 A visit on our last day to the Angkor National Museum helped us make sense of the history. I would certainly recommend it as a place to visit, probably at the start of your trip rather than on your last day like us -ooops! In total there are supposedly 216 giant faces (someone had too much time on their hands!) 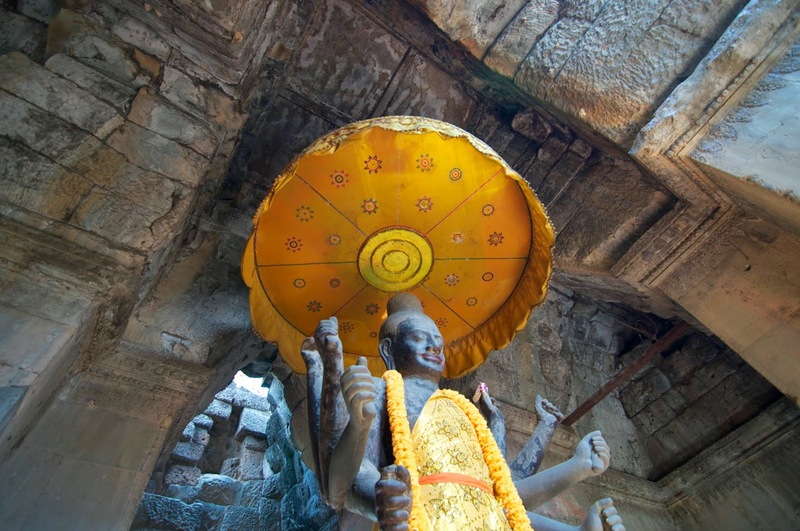 adorning this temple and they are believed to be that of the first king who built it, Jayavarman VII. In reality an amazing, slightly bizarre,labyrinthine and cluttered temple. 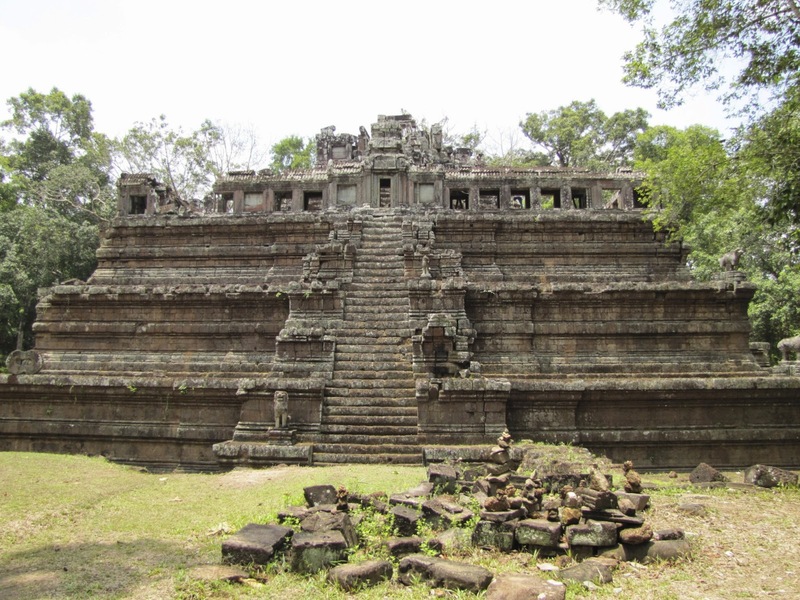 We walked onto Baphuon next. 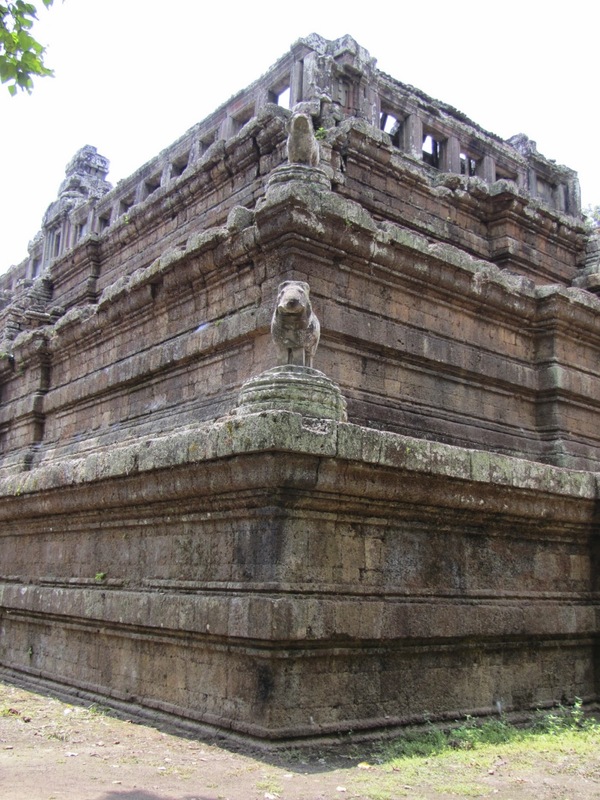 This is a three tiered 11th century Hindu temple although it later converted to a Buddhist one! It originally stood around 150 meters tall and I amazed myself but actually climbing up the steep wooden steps all the way to the top, not bad for someone frightened of heights, and even more amazing I got down in one piece too :) Surrounding the temple are blocks upon blocks of stone from this temple, as far as your eye can see disappearing into the jungle are blocks of stones, like most of the Temples in the area it had been left to the ravages of time and the jungle until the 20th century. 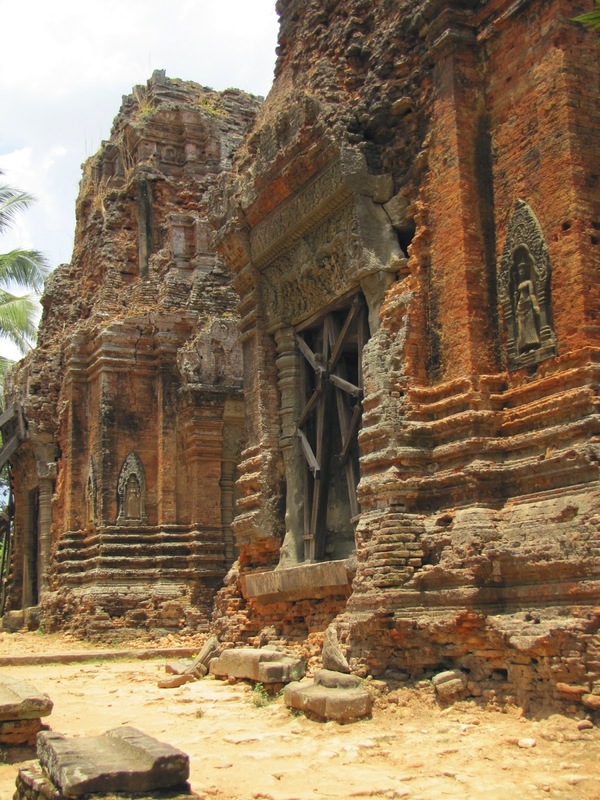 The Baphuon restoration started before the Khmer Rouge era, however the people who had started work on its restoration, along with the plans were lost during this turbulent time in history, so much is incapable of being put back together without pure guesswork. As we exited Baphuon at the rear we looked at the undulating strange back of the temple so different from the other 3 sides and suddenly realised what we were looking at was a reclining Buddha making up the whole side of this temple - utterly amazing and to think how this was constructed in the 11th century. 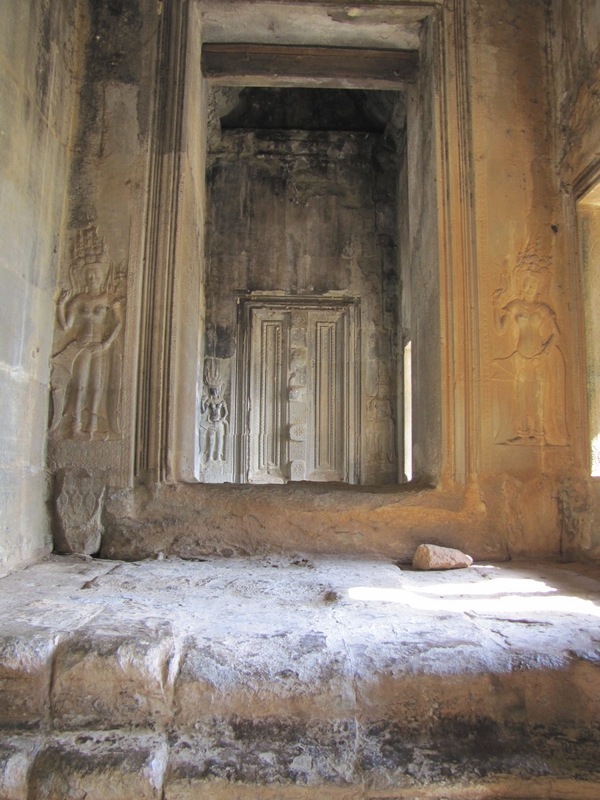 Can you spot the reclining Buddha making up the back wall of Baphuon? 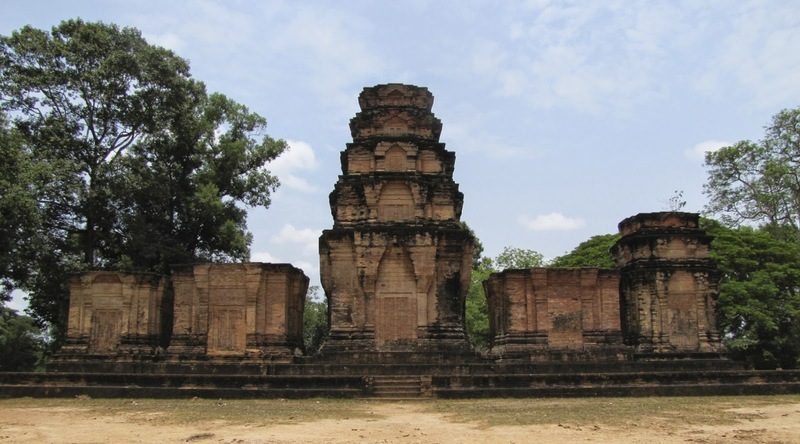 We passed by, but didn't climb, the 3 sided pyramid shaped,late 10th century Hindu temple of Phimeanakas (love the sound of that word) Phimeanakas, yes I said it again! means celestial temple and it certainly points upwards to the heavens. To be honest we were melting a tad now in the severe heat. Back to the tuk tuk we walked across the 13th century Terrace of the Leper King named after the Hindu god of death Yama who's statue is at this site. The statue was marked and discoloured and had the appearance of someone with leprosy hence Leper King. At the far end of the Leper King terrace is another older 12th century terrace, that of the Elephants Terrace. As you would imagine it is decorated in hundreds of elephants. This terrace was used as viewing platform for royal and public festivities. 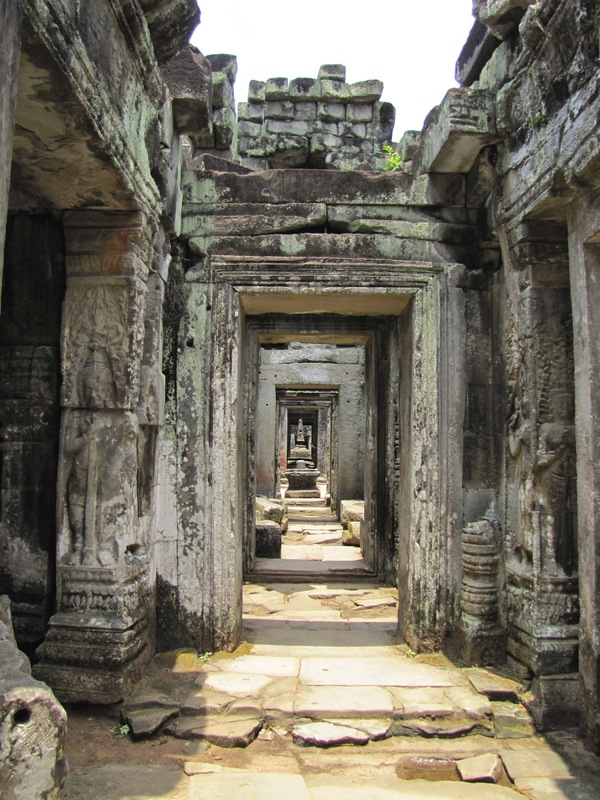 If you ever get a chance to visit the temples this Preah Khan must be near the top of those to visit. 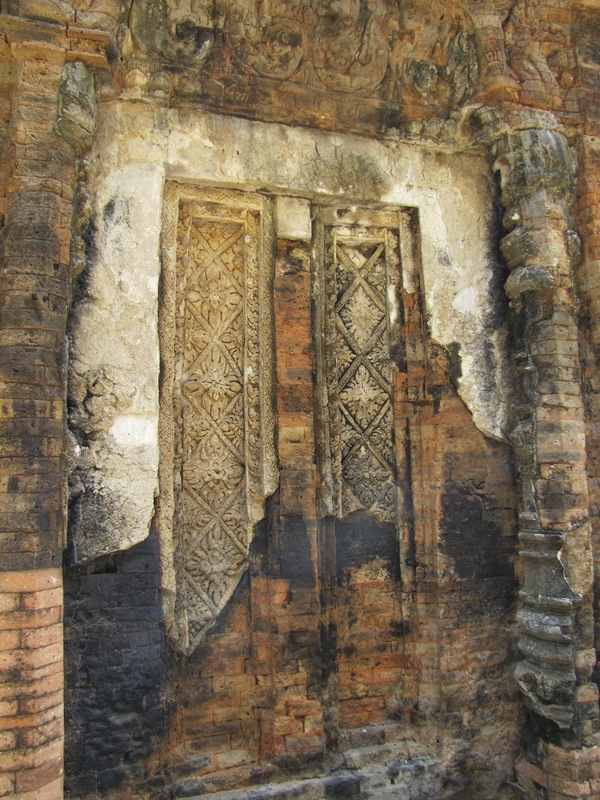 Unlike many of the tall temples we had just visited this is a flat 12th century Buddhist temple with later Hindu additions. 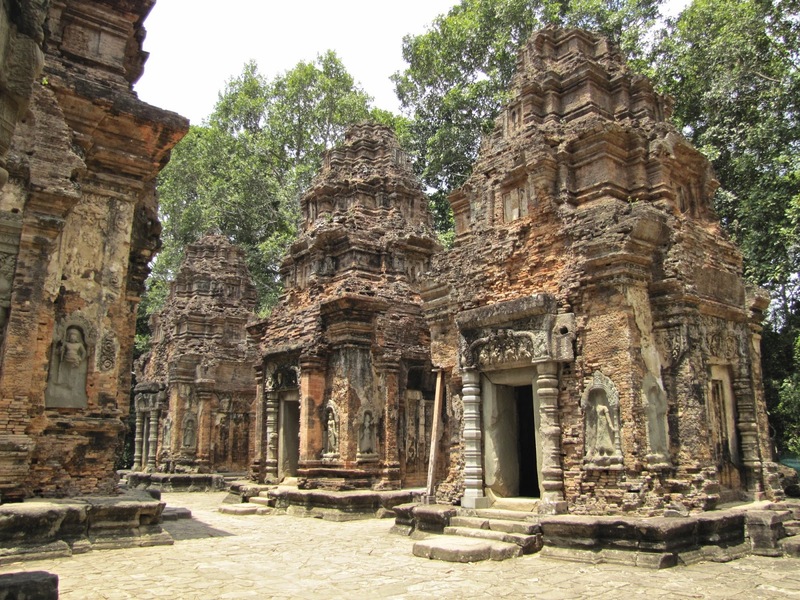 At one time there were 430 deities on this site and it was used as a city, temple and university. 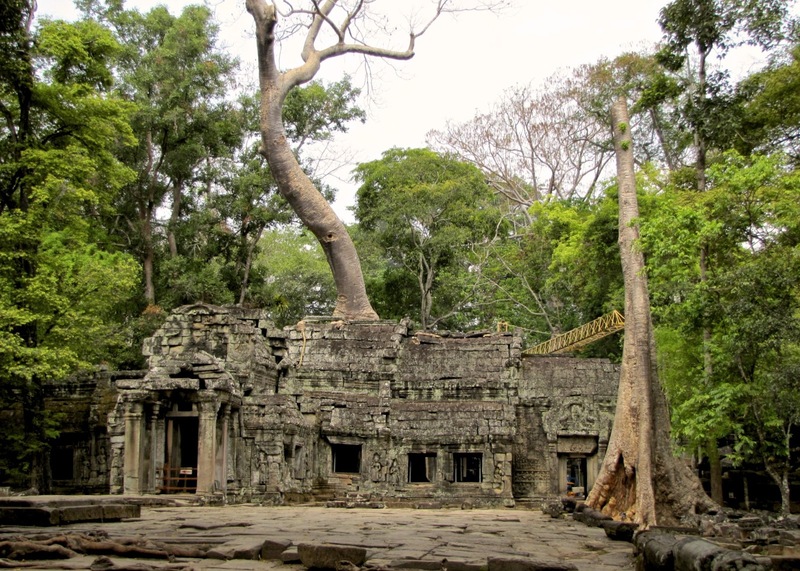 Like Ta Prohm it had been left to the jungle and almost completely destroyed, with the building becoming one with the trees. 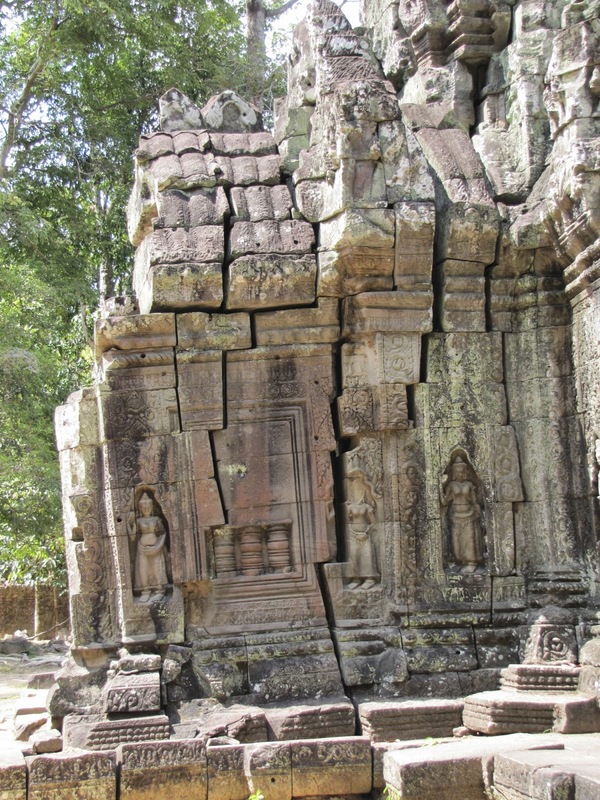 It is now managed by the World Monuments fund with careful restoration and maintenance taking place. 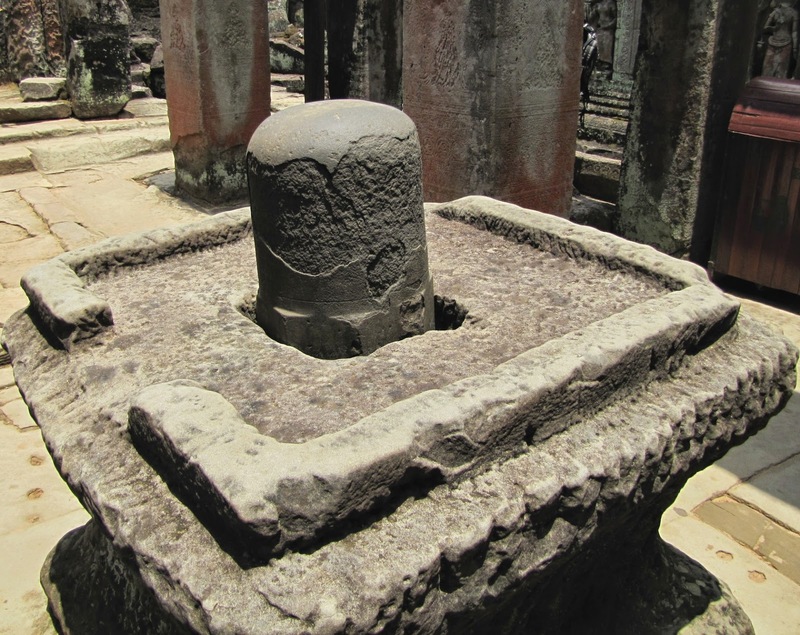 A lingam - representing a male sexual organ and a yoni, the females. 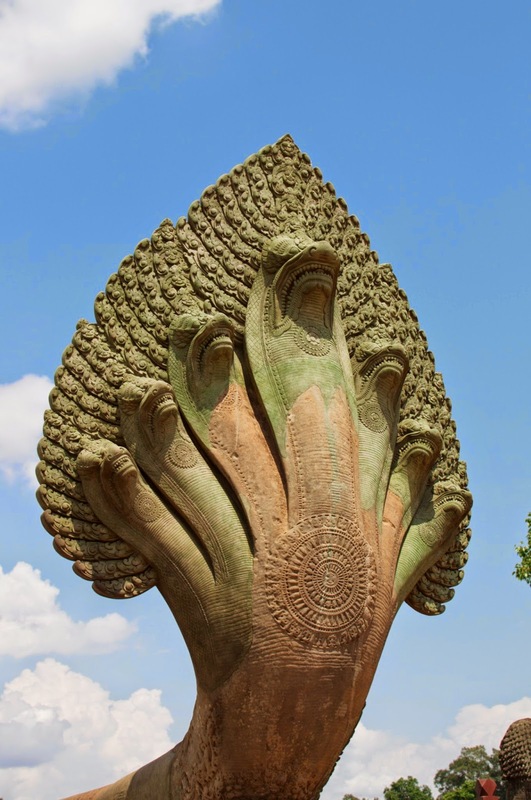 The Lingam is supposed to be the origin of the western maypoles?!? 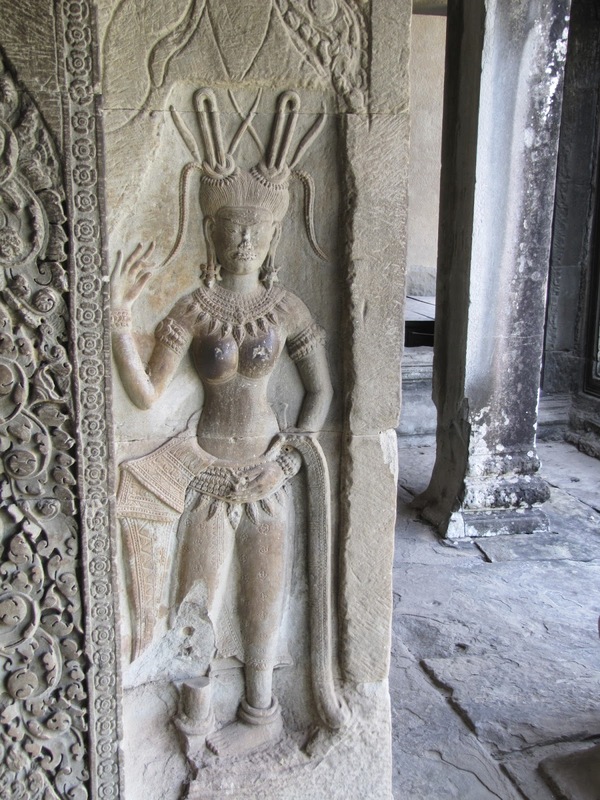 Final stop for day 2 was Ta Som, a relatively small 12th century Buddhist temple. 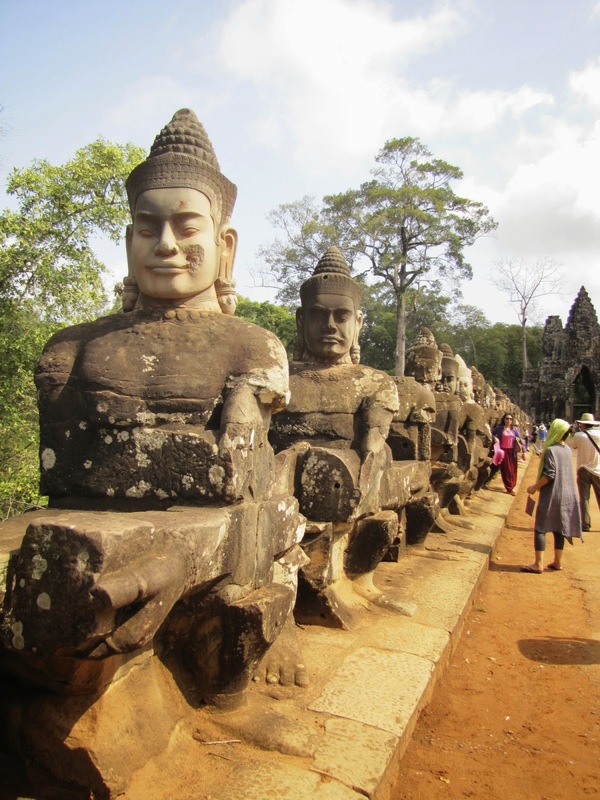 Again you will see faces like those adorning Bayon, you will also cross over the remains of the moat flanked by the ever present Naga and Garudas. 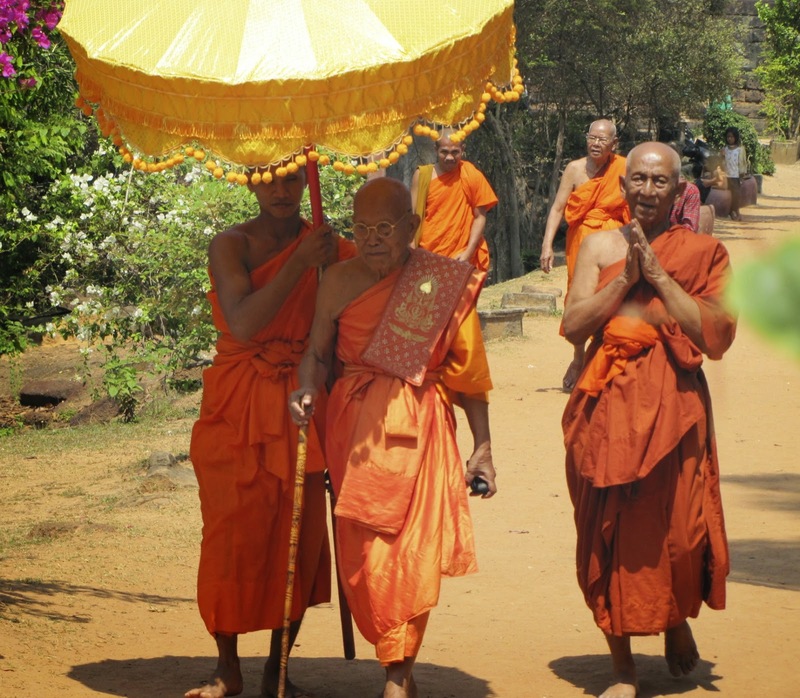 Garudas are mythical human-like birds that are found in both Buddhist and Hindu cultures. Our final day for viewing these magical temples. We had seen many but would be leaving with still many more to discover, certainly making a very strong argument for another return trip. This day we went slightly further a field as we set out in the opposite direction to Angkor Wat and the other temples to visit the Roluos group, around 13km from Siem Reap, quite a trip in our little tuk tuk with our nether regions now slipping between numbness and pain from the jolting, but all good fun though! 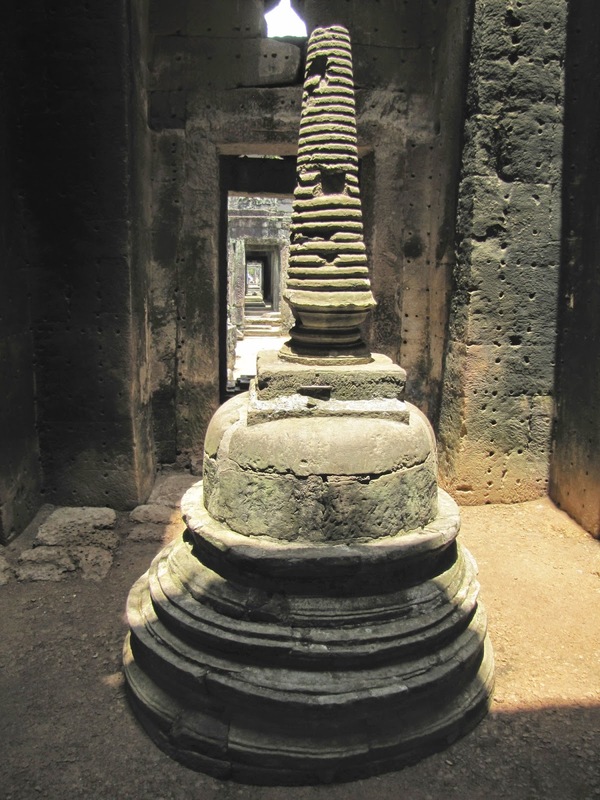 The Roluos group are some of the oldest having been built at the start of the Khmer Empire around the 9th century. The first of the Roluos group is Bakong the first "temple mountain" made from sandstone and dedicated to the Hindu god Shiva. 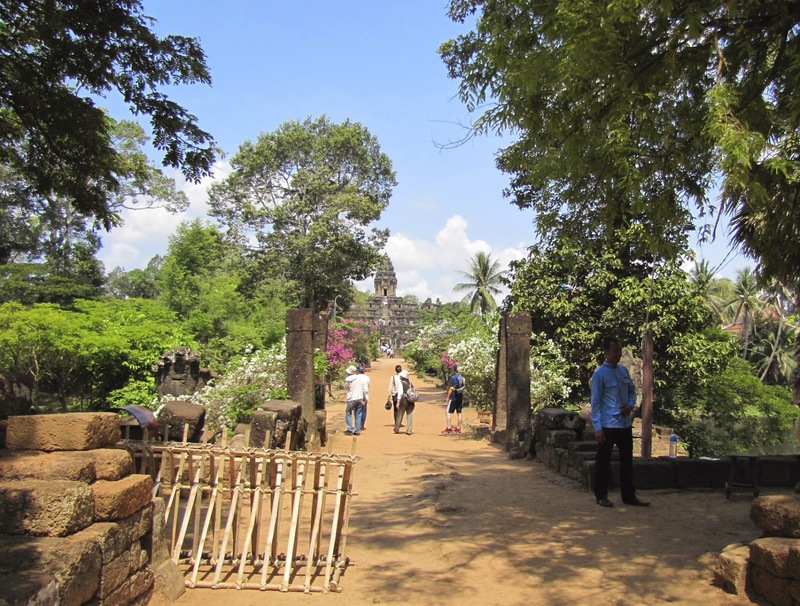 Bakong was the main temple in the capital city of the ancient city of Hariharalaya before it later moved to Angkor. 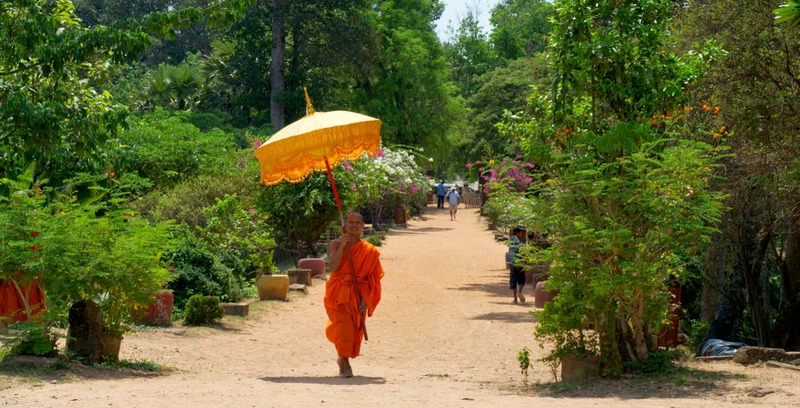 A stunning entrance to this temple as you walk over a flower flanked water filled moat. Here there is a modern Buddhist temple and school. 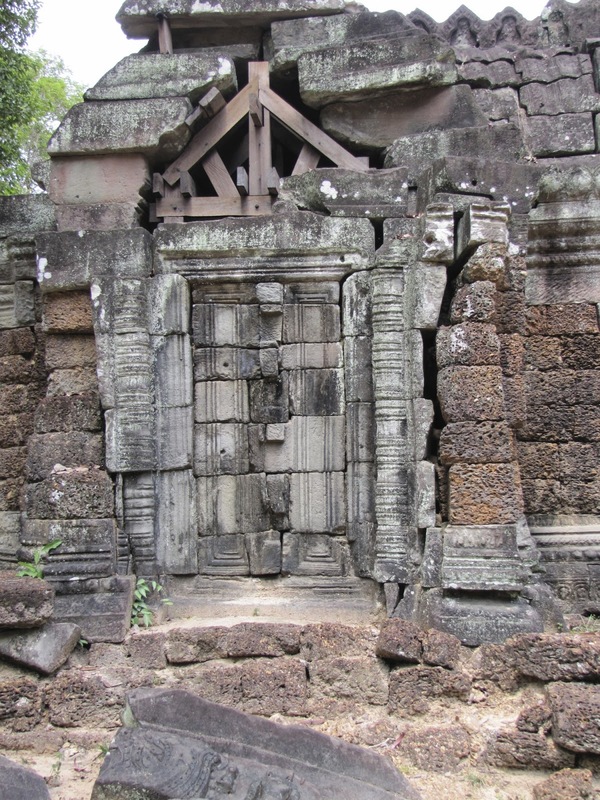 Preah Ko (sacred bull) This was the first of the temples to be built in Hariharalaya in 879 and is a Hindu temple. 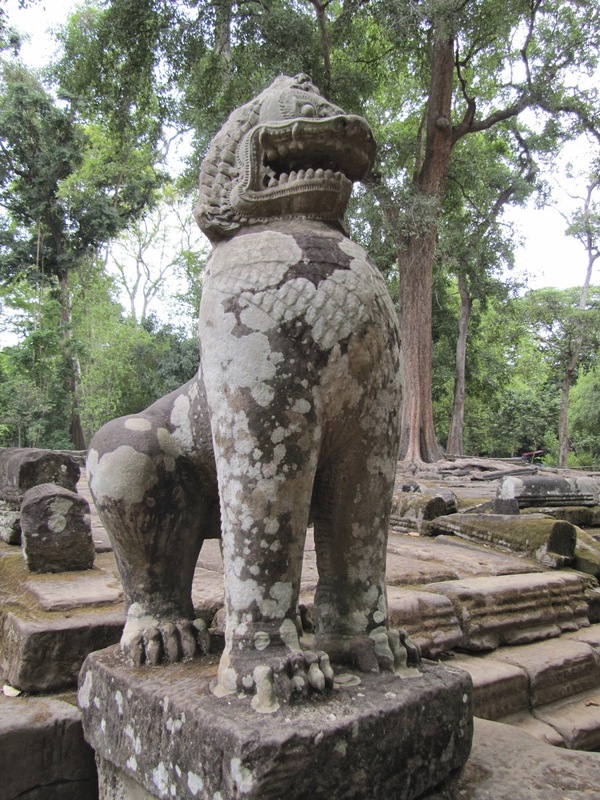 It is called Preah Ko, Sacred Bull, after the 3 statues facing the temples of Nandi, a white bull who the Hindu god Shiva rode. 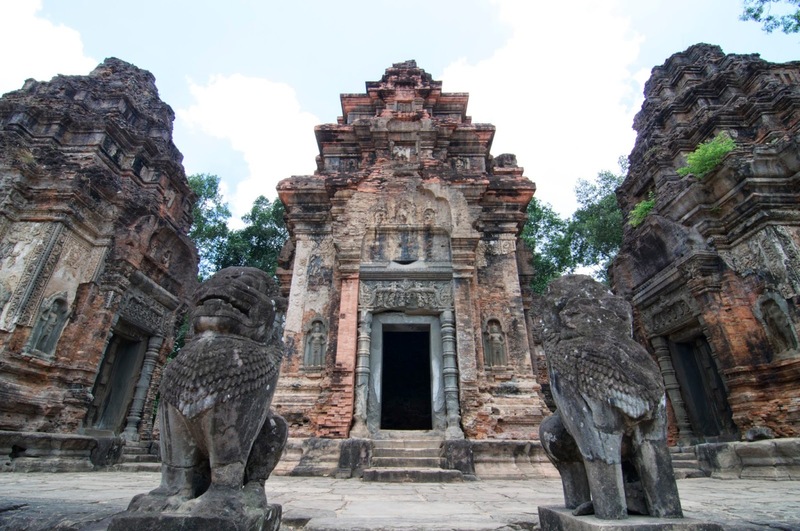 As with the other temples here in the Rulous group it was quiet, slightly away from the tourist masses and walking between the 6 brick towers of this temple you could almost feel the history and past pulsating from the buildings. 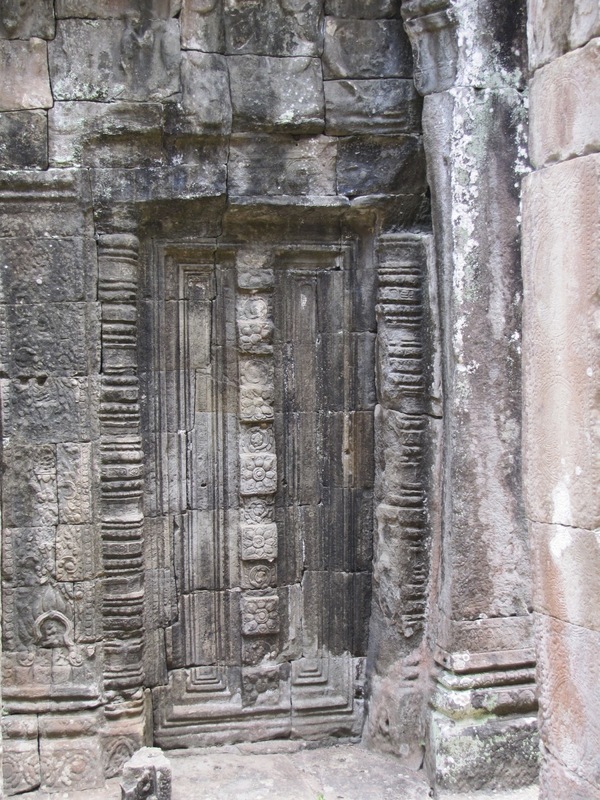 I was almost waiting for a Khmer king to appear in one of the doorways. Nandi the white bull who Shiva rode. A very mystical place, with a strange presence about the place. The last of the Roluos group was Lolei Wat. 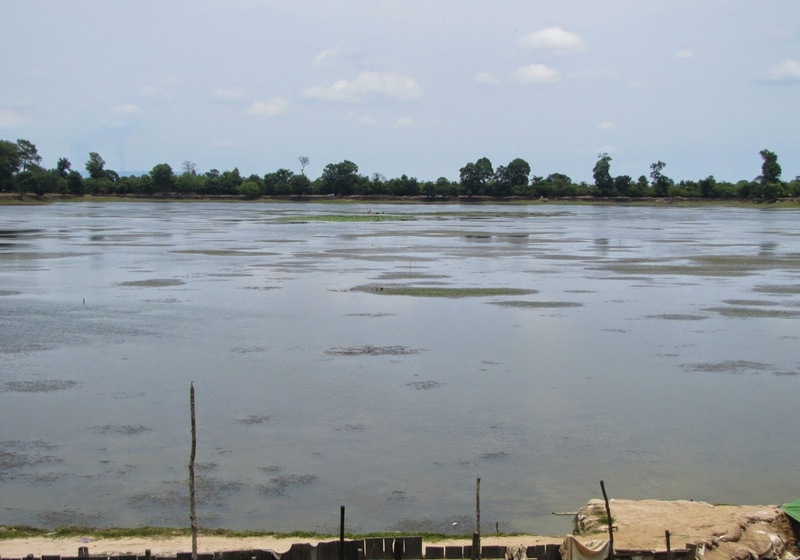 It is made up of four brick towers that were once positioned on an island. 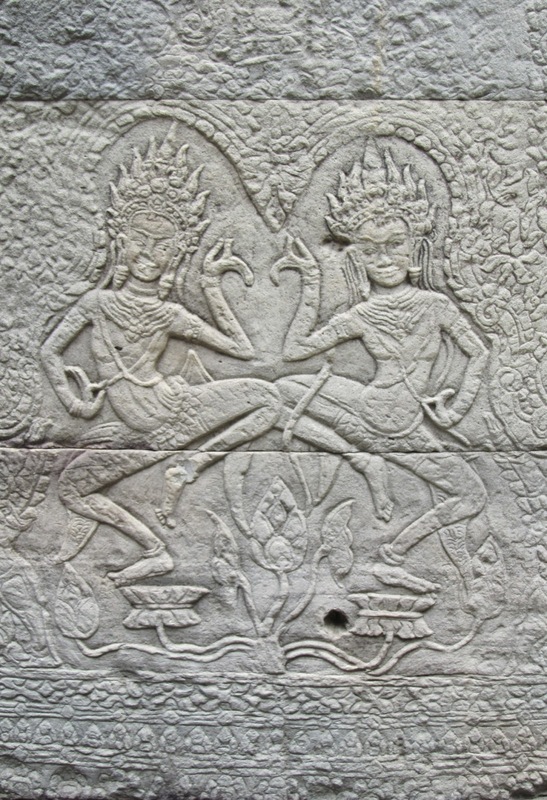 The front 2 towers were male and the back female, they represent the family of the Khmer king Yasovarman I, his parents and grand parents. These brick towers are highly decorated, but sadly in poor repair, but what can you expect after such a long period of time. 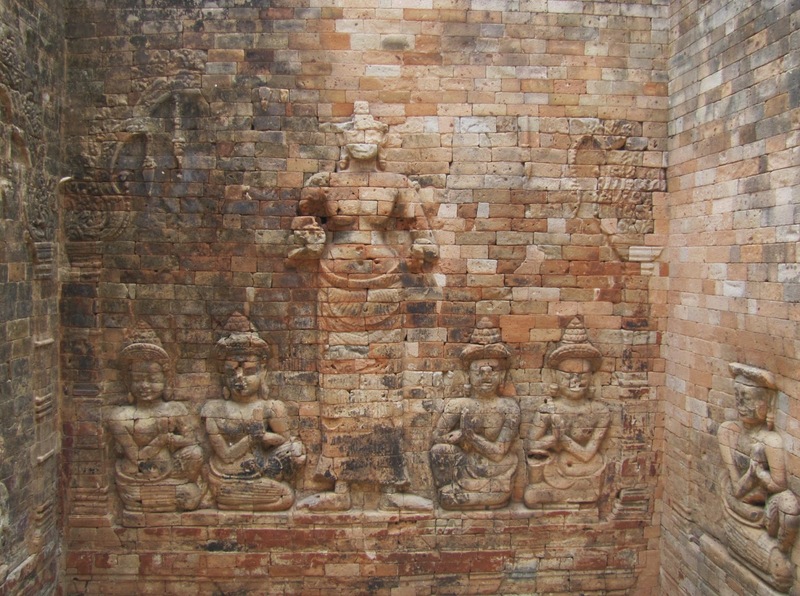 Surrounding the temple are a Buddhist monastery and school. 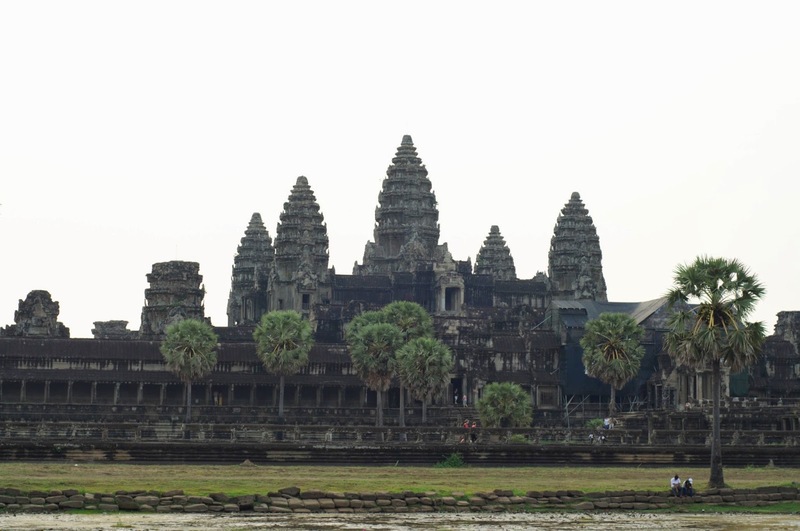 So that was our whirlwind 3 day tour of the major temples. What an experience, what a dream come true. To be honest after 3 days we were slightly templed out, but that doesn't stop me from wanting to make a return visit/visits and explore farther a field. There's just to much to see and learn and so little time, but I'll have a damn good go! I hope you enjoy the photos and quick description of them, I'm hoping it didn't sound to guide bookish. If you're interested in any of the temples there is copious information on each on the Internet, you could make it your life's work to learn about them. We visited so many and there was so much history and information it was quite difficult to get the balance right between getting the basic information over without going overkill. 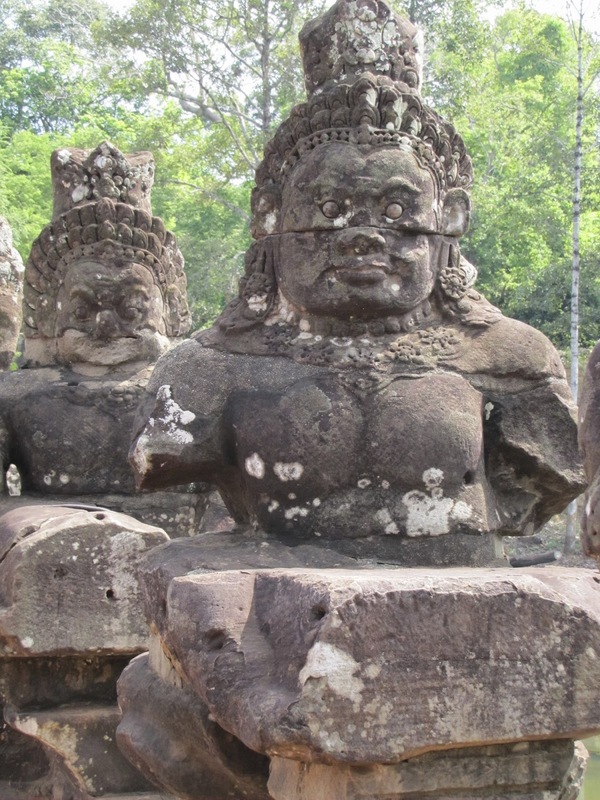 The restored head of the seven headed Naga outside the entrance at Angkor Wat.